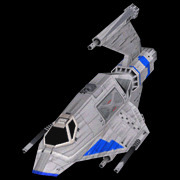 The Sienar Fleet Systems GAT-12 Skipray Blastboat was, early in the Galactic Civil War, the smallest hyperspace-capable starship in use by the Imperial Navy. The first GAT-12h Skipray Blastboats were released prior to the Battle of Yavin, and proved to be a reliable ship which saw use in Outer Rim planetary patrol forces and smuggling fleets for many years. Note that the Skipray Blastboat was never fully accepted in the Imperial Navy due to their reliance on attrition fighter concepts, despite the glowing reviews given to them. Therefore in Imperial fleets they are Limited Availability. Pirate and smuggler fleets, which gained access to the design in large numbers, do not have the same limited availability.